You are here: Don't Waste The Crumbs » Real Food 101 » High Fructose Corn Syrup: Why it’s Bad For You! 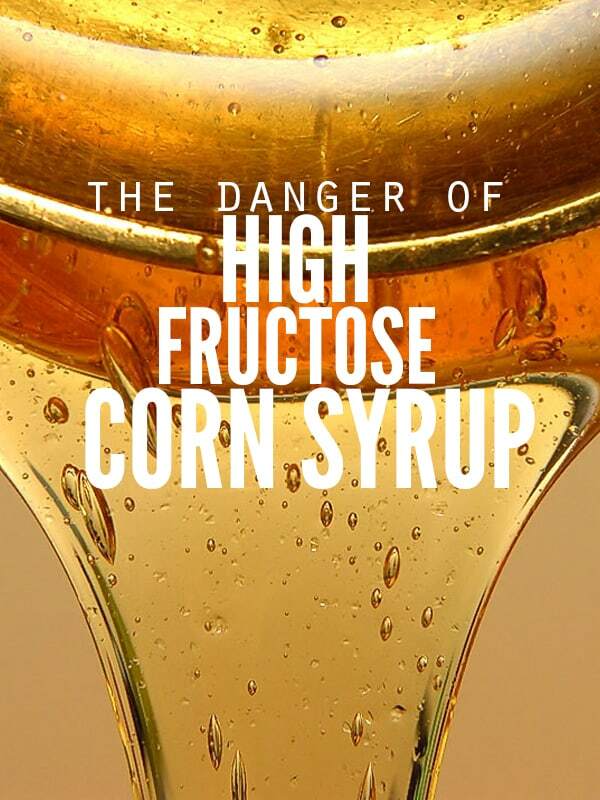 High Fructose Corn Syrup: Why it’s Bad For You! According to the U.S. Department of Agriculture (USDA), the average American devour 156 pounds of sugar in one year. The average child (under 12 years old) eats 49 pounds of sugar. Half of that measurement – for both adults and children – is consumed in the form of high fructose corn syrup. Want to know exactly what those 78 pounds consist of? HFCS is a chemical sweetener made up of a blend of fructose and glucose. Fructose (a.k.a. fruit sugar) is naturally found in many fruits, vegetables and honey. It is the sweetest of all natural sugars and is what gives apples and pears their natural sweetness. Glucose is also found naturally – produced by plants through photosynthesis and used by humans for energy. It is the least sweet of all natural sugars and is required for proper brain function. In fact, psychological processes requiring mental effort (i.e. self-control and difficult decision-making) are greatly impaired when the body’s glucose level is low. Although both fructose and glucose are found naturally, HFCS is not. This compound was first created in a science lab in the late 1950s. A Japanese scientist made mass production of HFCS possible in the late 1960s. The United States imposed a system of sugar taxes in the late 1970s, causing the cost of imported sugar to soar. Domestic producers sought less expensive sources and turned to high fructose corn syrup instead. Since HFCS is derived from corn – and the price of corn is kept very low through government subsidies paid to the growers – HFCS is a much more affordable and thus preferred option as a sweetener. Although HFCS is derived from corn – a natural and real food – the end result is anything but natural and real. 1. Corn is first soaked in 120° F water for 30 to 40 hours to release the starch. 2. The corn is ground to separate the germ from the endosperm. Each component is ground separately into a powder. 3. The starch is removed from each component by washing, and then drying. This resulting powder is commonly known as corn starch. 4. The enzyme alpha-amylase is added to break down the large molecular structure of corn starch. Note: Alpha-amylase is found naturally in our saliva – it’s what helps us to break down and digest food. However, HFCS manufacturers use alpha-amylase derived from the bacteria Bacillus, which is nowhere near as gentle as our own saliva. There are numerous strains of Bacillus, but those worth mentioning include one that causes anthrax, another that causes food poisoning and a third that is used as pesticide. 5. The enzyme glucoamylase is added to break the starch into glucose molecules. Note: Glucoamylase is also found naturally… in mold. Starchy foods such as bread and potatoes grow mold containing glucoamylase. 6. With the glucose molecules separated, the manufacturers add glucose isomerase, another enzyme produced through fermentation with variety of bacteria cultures and microorganisms. This converts the least sweet glucose to the most sweet fructose. 7. The resulting liquid is reduced to create a 90% concentration of fructose. Wow. Did you get all of that? Soak the corn, grind the corn, dry the corn. Add your choice of anthrax, staphylococcus or insect repellent. Then add mold. Finally, choose from the millions of available strains of bacteria, ferment them, and toss it in to make it a bit sweeter. You now have high fructose corn syrup. Dr. Robert Post of the USDA doesn’t think so. He says that both honey and corn syrup are metabolized as sugar. The Corn Association agrees too, claiming that table sugar and high fructose corn syrup are nutritionally and metabolically equivalent. However, table sugar is made of sucrose. As we just learned, HFCS is made of a high concentration of fructose. Fructose and sucrose are not metabolically equivalent. Our bodies do not process them the same. In fact, the Food and Drug Administration agrees that HFCS is not sugar. If it were, they wouldn’t have turned down a petition by the Corn Refiners Association to officially change the name of high fructose corn syrup to corn sugar. Just a few months ago, the University of Oxford and the University of Southern California released their results of a study involving HFCS. They found that consuming HFCS can cause negative health consequences – separate from and far more harmful than natural sugar. A team of Princeton researchers also did a few experiments. They found that rats given HFCS gained much more weight than those given sucrose (table sugar). During another experiment, rats given HFCS showed dangerous signs of what humans know as metabolic syndrome. Symptoms include abnormal weight gain, significantly increased triglycerides, an overall increase in body fat and a particular increase in visceral fat around the belly. As if that weren’t enough, some of the enzymes used to create HFCS may be contaminated with mercury. Mercury is toxic – in all its forms. 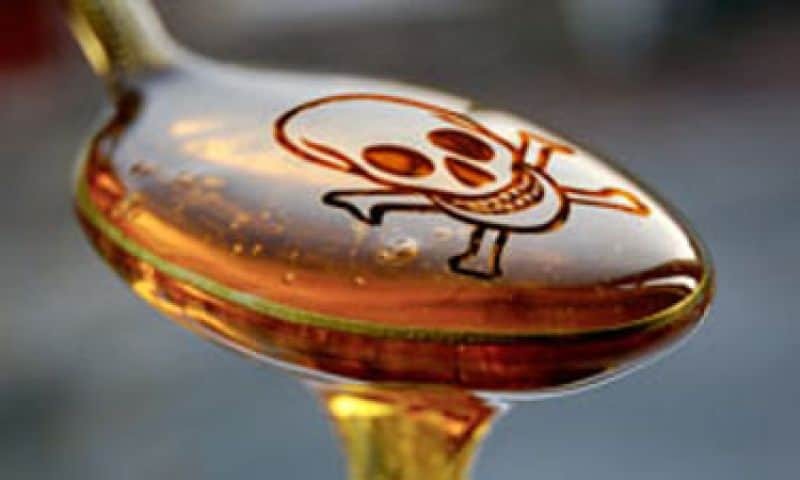 How do we stop consuming high fructose corn syrup? Simply put, we stop buying it. Read every label and if you see HFCS listed, don’t buy it. Open up your fridge, freezer, pantry and purge. Replace those items with an alternate version that doesn’t have HFCS. Better yet, make it yourself! You can save money and avoid bad ingredients including HFCS. Need dressings? Here’s Greek, Italian, Ranch, Dairy-free Ranch, and Caesar. Need jelly? Here’s strawberry apple butter or strawberry freezer jam. Want to make cookies? Scratch is always better. Oatmeal chocolate chip and ultimate chocolate chip are two of our favorites. At Christmas we like Healthier Sugar Cookies and Healthier Candy Cane Cookies. Want bread? Man Bread and The Best White Sandwich Bread are favorites in my house. No Knead Artisan Bread is perfect if you are new to making food from scratch. If you’re in a season where making food from scratch isn’t the best option, there are several places online that have good prices and quality foods. Of course you will STILL need to double check the ingredient lists (I re-learned about that when we did the Whole30), but this is a good place to start. Thrive Market – Crumbs readers get a FREE jar of coconut oil with their first purchase when you buy through this link. Amazon – Prime subscribers get free 2-day shipping and can get discounts on groceries at Prime Pantry (more about that HERE). Try prime for 30 days free! Tropical Traditions – They frequently offer free shipping which helps a ton when you order heavy items in bulk. Brandless – Everything here is $3 each. And a lot of the options are organic. Vitacost – This online store has a wide variety of healthy options that are sometimes hard to find locally. Shop here to see their latest discounts and sales. Healthier choices and saving money go hand in hand. Cutting out foods with high fructose corn syrup is one simple way to take a step towards a healthier lifestyle. It means you are avoiding processed foods (that tend to cost A LOT) and gives you the control over what is going in your bodies (real food priorities). I’ve seen hundreds of families make real food a priority while cutting down their grocery budgets through Grocery Budget Bootcamp. This 8-week course gives you the tools to build lifelong habits to eat real food on a budget. Thanks for sharing! I’ve enjoyed reading your blog and appreciate what you share. Your blog isn’t overwhelming full of adds and you don’t promote sponsors that are giving you free stuff. Your ideas and recipes are realistic and healthy at the same time. Nicole, Thank you for the encouraging and reassuring words, and thank you for reading (and enjoying) all of my randomness! Also: once you stop eating it, you realize it tastes bad (when someone inadvertently feeds some to you). You are SO right! We had burgers at the zoo while on vacation and the only word I could use to describe them was “processed.” Rubbery, tasteless, processed! Thank you. If more people stop eating it, perhaps “they” will stop adding it to virtually everything! I find it interesting that the FDA refuses to call it sugar – I don’t trust the FDA AT ALL. I guess the corn refiners aren’t paying them enough. I’m anti-FDA as well. Our society is hooked on the stuff though. Perhaps if we continue spreading the news (amidst being called granola tree-huggers) it will make a difference someday! You’re welcome – I’m glad that it was helpful! And thanks for spreading the word Correna! This was a very nice write-up; I’m extremely impressed by the amount of effort and energy it took to learn all of this information. Thank you for simplifying it and passing it along ! This post was my favorite post yet – and by far – really had me thinking of how to clear out my pantry ! Thanks Mary Katherine! Dig deep and read carefully; this stuff is nearly everywhere! Thank you for this information. I love that you went to so many sources for it! I never knew how it was made, weird! Completely weird! It was all dandy until I read anthrax… and then I couldn’t stop reading! As a biologist, I find this article to be misleading at points. First, it’s pointless to invoke molds and strains of bacteria in your discussion of enzyme processing of HFCS. A purified enzyme is but a single type of the thousands of components that make up a cell, be they toxic or non-toxic. Because each enzyme has distinct chemical properties, it’s an easy matter to separate those enzymes from others, including potentially toxic proteins and other compounds. Finally, because enzymes are so efficient, it is not necessary to add more than a little to process a large batch of product. So, even if the specific species from which the enzyme was derived was toxic, it would not mean in the slightest that the enzyme itself is toxic, or that the enzyme (or even contaminants!) would be retained in significant amounts after processing. As far as metabolism, the main difference between sugar and HFCS is both in the lack of linkage (not so important) between the glucose and fructose units, and also in the slightly ~5% higher concentration of fructose in HFCS. This 5% difference adds up to quite a bit more fructose over time, which may account for the results in the studies. I personally avoid products with HFCS, but I feel that these kinds of articles are doing more to scare than to educate on the subject. I think article shows a profound lack of scientific understanding of the chemistry, biology, and engineering in the production of food and food additives. Taking random small studies and drawing broad generalizations about the health effects of an item is at best unwise. This sort of fear mongering about our food is much more about marketing than anything else. Hi Ben! I’ll admit to not having an engineering degree in chemistry, biology or food engineering, but that’s precisely my point – I shouldn’t have to understand science at a molecular level in order to know what I’m eating. If that’s the case, then I’m likely not even eating food. I’m eating “food-like” items that are products of chemistry, biology and engineering professionals in labs! Tiffany, That is EXACTLY it! We are not scientists so we have NO IDEA WHAT THEY ARE FEEDING US. So what if its minimal? its there! and guess what? people don’t eat one oreo or one cheeto. ( yes we know theres many other more unrecognizable ingredients in those, but according to your theory, so what? they are minimal right?) so where do the chemicals go? Point is, if you are a scientist, I think morally, it’s your job to make us healthier, not sicker! FOR FREE. Do us all a favor and make your own blog and enlighten “us dumb ones”. I found this article to be exactly what I needed to to be informed in making my choices when I go shopping. Tiffany, is corn syrup just as bad as HFCS? I LOVE your website and all of your articles. Thank you for sharing your knowledge with us! Hi Pam! Thanks for your kind words! Corn syrup isn’t “as bad” as HFCS, but it’s definitely not good. If I had to rate the level of processing of HFCS on a scale from 1 to 10, with 10 being the worst, it’s a 10. Corn syrup would be an 8. It takes just one more step to turn corn syrup into HFCS. I hope that helps!